On Saturday, October 4 at 8:00PM, The Long Beach Symphony will perform Aaron Copland’s 3-minute Fanfare for the Common Man, an introduction to their 2014-15 80th Anniversary Classical Series. 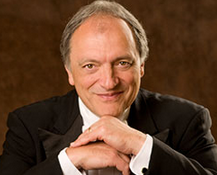 Conductor John DeMain, Madison Symphony’s Music Director and former Music Director of Orange County’s Opera Pacific, will lead the musicians in a masterful fanfare sure to send chills up the audience’s collective spine. The Long Beach Symphony, the sixth-largest symphonic orchestra in California, is celebrating its 80th anniversary by placing street banners along Ocean Blvd., Naples Bridge and within the Long Beach Airport. The banners show off several of the Symphony musicians, some of whom are featured soloists this season. Performances this year will celebrate not only the musicians but will also seek to expose local audiences to to some of the diverse talents and unique personalities of some of best conductors around. This season is a transitory period for the institution, according to the press release, with six Classical series and five POPS! concerts, as well as more than 150 free music education programs with Long Beach Unified School District, and a free chamber-music series in venues throughout the community. The opening night performance will showcase Edvard Grieg’s Piano Concerto in A Minor—his only concerto—interpreted by guest piano soloist, Christopher Taylor, with a rambunctious opening passage and rhythmic, dance-like finale, according to the release. In the second half of the program, audiences may be enchanted by Rimsky-Korsakov’s Scheherazade, performed by Concertmaster Roger Wilkie who interprets the musical portrayal of the woman who convinced a Sultan to spare her life by telling him one-thousand-and-one stories of Arabian nights. For more information, or to purchase a season subscription, please visit the Symphony’s website or call 562-436-3203.